The Forklifter System – The ultimate solution for lifting your forklift fleet for ease of maintenance and major component replacement. 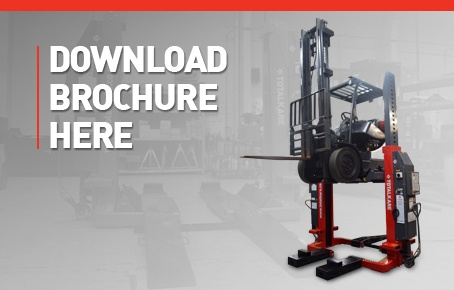 The Forklifter System can save you money and increase safety levels whilst improving both productivity and efficiency. General Access – allowing safer & more efficient working conditions. One Man Operation – reducing health & safety issues. Mobility – allowing easy movement of equipment. Cost Effective – both in terms of comparison with alternative lifting methods and increased efficiency on an operational sense.